AC Milan striker Gonzalo Higuain is being widely linked with a transfer to Chelsea this January, and it seems he’s doing everything to get out of the San Siro. Gazzetta dello Sport provided an update on the Higuain situation today as Chelsea have to also negotiate with the Argentine’s parent club Juventus, who loaned him to Milan last summer. 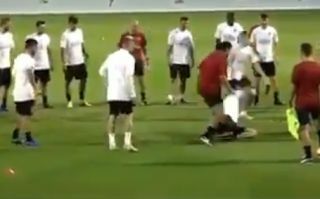 Still, for now Higuain is still with Milan and this training video is doing the rounds today after he took out manager Gennaro Gattuso with a hard slide tackle. We assume this is NOT him taking his anger out on his manager over the lack of a move so far, but it makes for interesting viewing nonetheless!